Richard Whiteley’s studio-based practice uses cast glass to explore negative structures and suggested forms in glass solids. 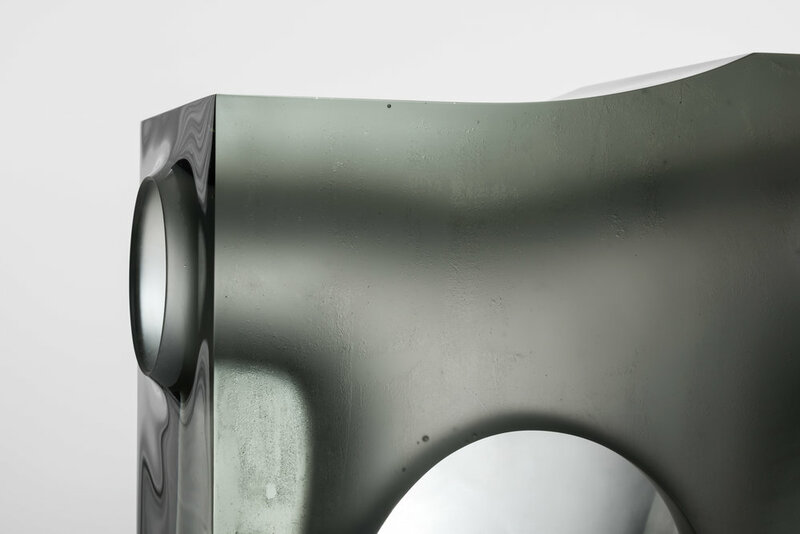 He employs voids as a primary compositional element, allowing the architecture to be shaped by the unique material properties of glass, which invites an overlaying of form and light. The phenomena of light, concepts of illumination and ways of seeing are constant sources of inspiration that Richard considers and explores through the act of making. I strive to create works that evoke concepts of space and elicit a sense of wonder within the viewer. I see glass as a substrate that is activated and animated by light. Its qualities of transparency and translucency are the agents within the work that create the dialogue between these positive forms and negative spaces. Richard began working in glass at the age of 16, as an apprentice within a stained glass workshop. He obtained an undergraduate degree from the ANU School of Art & Design, majoring in glass, followed by an MFA from the University of Illinois, majoring in Sculpture. After several years of teaching and studio-based work, Richard is again in Canberra as Head of the glass workshop at the ANU School of Art & Design, running his practice from his Queanbeyan based studio. In Richard’s latest works, the geometry and the language of architecture has lessened, and the body has become an increasingly important point of reference and departure. His most recent works emerged in response to the deciphering of MRI imagery, following a series of family illnesses. The translucency of glass, allowing the overlaying of exterior structures and internal forms, provides the perfect foil for me to contemplate consciousness, embodiment, existence and loss; light shudders through the material, bringing with it an ambiguity regarding what is solid and what is void, provoking us to lose sight of what we are viewing as we look into these corporeal forms.